Innovative! Brilliant! Impossible! As seen on TV! 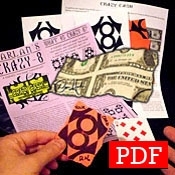 So, what IS Crazy-8? A SIGNED piece of paper is Torn, Rearranged, and Restored MIS-MADE... and it's still SIGNED! No Tape, No Glue, Just Magic! The spectator keeps the cool souvenir of your awesome magical powers. PLUS, you'll learn how to do it with a Borrowed Dollar Bill! Imagine that! Includes: Fully Illustrated Instructions with the Professional Script written and performed by Harlan. Original Artwork for making your own gimmicks... no refills needed! Full Instructions for Crazy-Cash with information on how to obtain the secret materials needed. Copyright © 2014-2019 Dan Harlan Magic. All rights reserved.